The Maryknoll Mission Archives records the extensive history of the Maryknoll Fathers and Brothers, the Maryknoll Sisters and the Maryknoll Lay Missioners, the lives of their members and the peoples they serve. The Maryknoll Mission Archives is the official repository of all inactive materials, regardless of format, of administrative, legal, financial, and/or historical value created or received by the Society, the Congregation, or Lay Missioners in pursuance of their work. 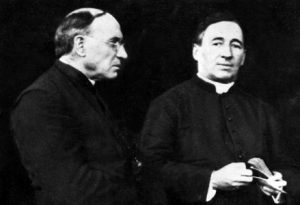 The records reflect the internal development of the Society, the Congregation, and Lay Missioners, including, but not limited to, documentation of functions, policies, decisions, procedures, operations and other activities. In addition, the Maryknoll Mission Archives documents the individual experiences of Maryknoll members, the peoples they serve, and the countries in which they minister. Founded in 1990, the Maryknoll Mission Archives consolidated the Society’s archives, which had been in existence since the 1950s, and Congregation’s archives, which the Sisters established in their foundation year, 1912. Although jointly administered by the Society and Congregation, the Maryknoll Mission Archives maintains the integrity and separation of the two collections. The Lay Missioners joined the collaborative Archives in 2001. The Archives is a collaborative venture, jointly staffed and jointly funded by the Society, the Congregation, and Lay Missioners. Housed under one roof and administered by a common staff, this undertaking reflects a shared vision, yet the integrity of the archives of each entity is maintained. Moreover, it enables the department to extend Maryknoll resources and to provide better access to Maryknoll’s rich heritage. 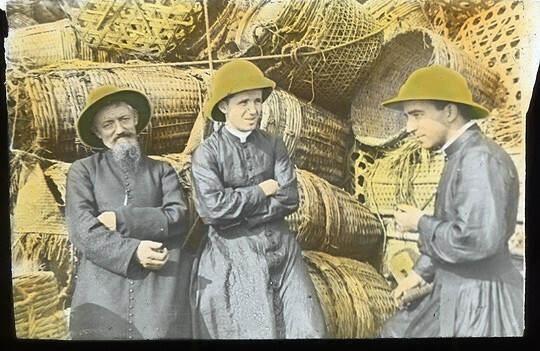 Colorized lantern slide of Maryknoll Fathers James E. Walsh, second from left, and Francis X. Ford, third from left, with Bishop Auguste Gauthier, M.E.P. A large pile of woven baskets provides a backdrop. For more information, visit MaryknollMissionArchives.org or we welcome you to send your questions to us. The Maryknoll Mission Archives collects, appraises, organizes, describes, preserves and provides access to these records in accordance with regulations established by the Society, Congregation and Lay Missioners and according to established Archives policies and procedures. The Maryknoll Mission Archives staff is happy to answer questions regarding research access to archives materials. All onsite researchers must submit a Researcher Application (PDF) and are encouraged to speak with a staff member about the nature of their project prior to their visit. Researchers working on projects for publication such as dissertations, books, articles, films, etc. should accompany their researcher application with a detailed project proposal and curriculum vitae. Research requests must be approved by the Archives and the Society, Congregation or Association leadership prior to the start of research. Maryknoll Archives Reading Room hours are Mon. thru Fri. ~ 8:30 am – Noon & 1 – 4 pm. Before starting research, all researchers are asked to agree to the Rules of the Archives’ Reading Room (PDF). The Maryknoll Mission Archives staff recommends that you employ the fullest form of the citation available in citing works from the archives to ensure that we can trace the collection or series from which the materials are filed. Please refer to the Archives official Citation Policy (PDF). 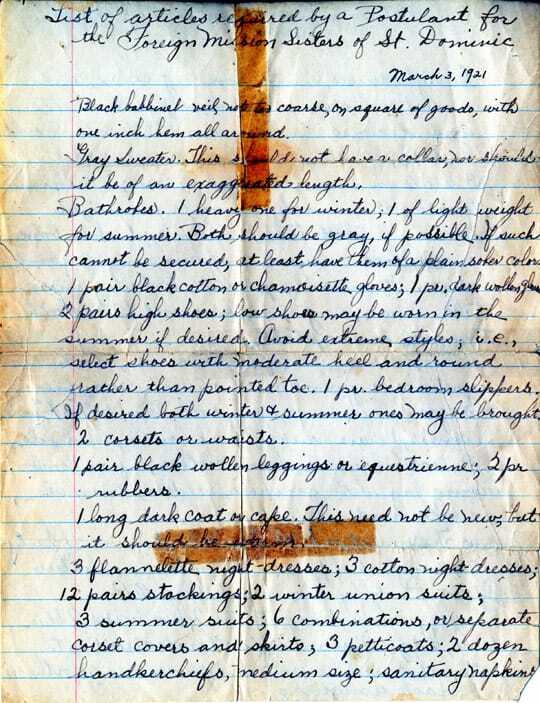 For further information on any of these points, please consult the Archives staff – 914-941-7636 x2500. Those interested in reproducing photos or images of other materials from the Maryknoll Archives can complete and submit our Image Permission of Use Request form (PDF). We also recommend familiarizing yourself with our Image Reproduction Policies.